We are George and Apostolos (Tony) and we live in Athens/Greece. Both of us had dogs in the past as we cannot imagine our lives without them. George had a Peke for over 10 years and Tony had a Doberman and a German shepherd. Back in 2009, George got his first Chihuahua called Emily, from a French kennel. Emily’s beautiful appearance, intelligence and her unique temperament was the reason that we very fast got in love with the specific breed. So, very soon we realized that we want to deal seriously with the breeding of this breed. Due to our love and passion for the breed, we decided from the beginning that our goal was to make the breed well known in Greece and try to contribute in its improvement. So, in order to gain some excellent, both morphologically as well as temperament dogs, we came in contact with the top breeders worldwide. Through this process, we met and became friends with several breeders who trusted us some very good Chihuahuas. Their assistance was priceless both in terms of selection as well as breeding and exhibiting. We are very proud as in a relatively short time we managed to create a small team with high quality Chihuahuas, with the majority being direct descendants of world champions. 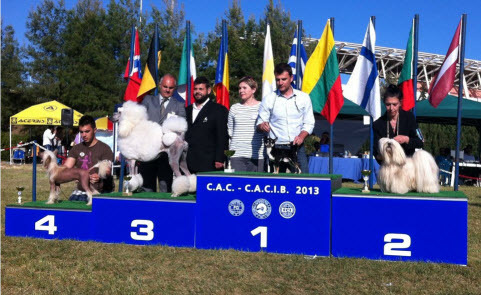 We started very early to show our dogs at exhibitions both in Greece as well as abroad. Distinctions came very fast. During our travels we got to know other notable breeders eager to the breed so our friends list got even longer. The aim of our kennel is breeding quality and not quantity. For this reason, every mating we make is the result of a mature selection. Many times we do not hesitate to go abroad to use a valuable stud that we believe could further contribute on improving our lines. We have a lot of passion for the breed and we are committed to do our best.